This year, La-Z-Boy of Vancouver has furnished the grand prize home at High Point Equestrian Estates. With the help of our talented designer, Debbie Heal, the home looks beautiful and is ready to be shown off! Now that you’ve seen how beautifully the home has been furnished, you probably want to know what inspired Debbie when designing the BC Children’s Hospital Lottery grand prize. We sat down with her for some insight and here’s what she had to say. Stones, stones, and more stones! I was inspired by the different stone that was used throughout the house. When you walk through the front door you’ll see the beautiful see through fireplace that is clad in marble. As you continue into the great room this marble surrounds the other side of the fireplace and soars up to the next level. Turn your head and you’ll see a large kitchen island with attached table that is fully encased with a beautiful&nbsp;Brazilian&nbsp;corteccia granite with built-in table. Turn&nbsp;your head again and you see a backlit quartzite in the wine display. All of these stones have their own distinct patterns.&nbsp;These stone patterns became my inspiration.&nbsp;I wanted to layer more patterns into the room. I did this by using monochromatic tones with different scales of pattern. The draperies have a large pattern on them, and because they are 20 feet high they have a big impact on the room. The carpet, accent chairs and toss pillows in the great room all add to the layers of pattern. Pattern doesn’t have to come just from fabrics. For this home, we used metal chairs that have a twisted metal patterned back; with 8 of them at the built-in table they form quite a pattern.&nbsp;Pattern can come in form of texture as well. The sofa and sofa chaise have a textured stripe with a contrast welt that gives the sofas an outline pattern. The patterns continue into the dining room with the draperies and the use of patterned fabric on the chairs.&nbsp;Take a look at the room with this inspiration in mind you will be able to pick out all the different patterns. What are your favourite features or elements of this home? I love the color of the wood stain on the floors, beams and the front doors. It’s very warm and inviting. I also love the nature inspired spa on the lower level – it’s got a sauna and steam shower with jets! Imagine coming home after a long day at work and being able to visit your own spa at home. I get so relaxed just thinking about it! Why is La-Z-Boy of Vancouver such a great fit for furnishing the lottery home? La-Z-Boy of Vancouver has such a wide variety of styles and fabrics to choose from that whatever your inspiration is you will be able find that perfect fit. As you can see, our design experts can gain inspiration from all sorts of factors in a home. Anything from existing patterns and fabrics, shapes, design, or architecture – the La-Z-Boy of Metro Vancouver design experts have a keen eye for detail and can help turn your design dreams into reality. 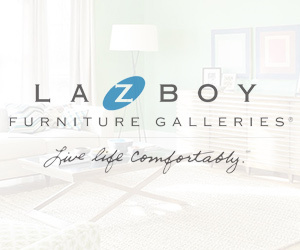 Lifestyle Meets Comfort offers free in-home consultations as a part of La-Z-Boy’s interior design services. Our expert designers can transform your home into the functional living space that is trendy, stylish and cool for you. Book your free in-home consultation and see what they can offer you too!